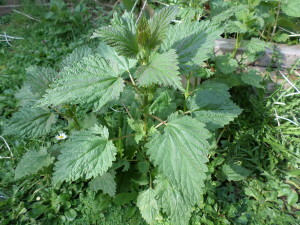 Last year I grew stinging nettles (Urtica dioica) from seed I bought from Ravenhill Herb Seeds. This year they are growing vibrantly, and starting to spread from the bed in which I planted them. So I decided it was time to make use of them. It is so lovely to be able to go out and pick something fresh from the garden! The young leaves were once widely used in the spring diet to revitalize the body after the winter. I see they are being offered for sale at the Community Farm Store in Duncan. I’ve also seen them available previous years at the Saltspring Island Farmer’s Market. Some of you may be lucky enough to have some growing in a corner of your property, or find them growing wild nearby. They are native to North America, northern Europe, parts of Asia and northern Africa. They particularly like moist soil and are abundant here in the Pacific Northwest. Stinging Nettles are called that for a reason, so be sure to wear gloves and long sleeves when harvesting. If you do get stung, it will burn for a couple of hours. Apparently dock leaves rubbed against the area can help, as can crushing the stinging nettle leaves themselves (with a glove) and rubbing the juice on. Heating or drying the leaves removes the sting. Stinging nettle is nutritious, high in iron, calcium and potassium, a good source of fiber and Vitamins A and C. Herbalists have used nettle for centuries to treat allergies. There are many other medicinal benefits to Stinging Nettle. For culinary purposes, use the young leaves. The nettle tea I made with a couple of tablespoons of sliced leaves, 2 cups of boiling water and little honey, was a very pleasant tasting drink. Nettle leaves can be cooked like a vegetable, similar to spinach. 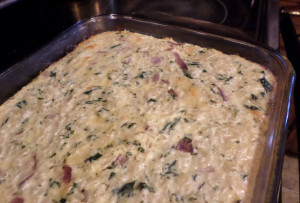 I made a delicious casserole from a recipe I adapted from herbmentor.com. Preheat the oven to 350 degrees. I boiled the nettles for about 10 minutes, which ensured the sting was gone. I mixed the nettles with the rest of the ingredients and baked in a greased casserole dish for about 45 minutes. Most of us liked it and the dish was empty at the end of the evening. I felt it needed a little salt, but that’s a personal preference. I made a separate version without the cheddar, using almond milk for myself and it was very good as well. I would certainly make this again. Seems to me that planting stinging nettle seeds in these parts is a bit like planting blackberries – crazy :). But in fact, I don’t have any here – I’d have to go look for some growing wild somewhere. I’ve had nettle tea, but never tried cooking with them. There’s an hilarious episode on Good Neighbours with Tom and Barbara harvesting nettles from the local golf course for making dye and tea – Barbara’s arms turn green – hopefully yours didn’t! Well I may be crazy, but I’ve planted both. 😉 We didn’t have any stinging nettles that I could find in our woods, and while we do have blackberries, they don’t get enough sun to produce much. I’ll have to check out using nettles to dye.